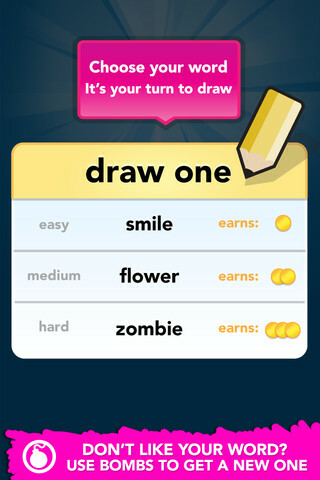 Developer Quote: "Play the Free version of Draw Something, the most popular social drawing and guessing game in the App Store!" Challenge friends on Facebook or via e-mail or be randomly partnered with gaming buddies. Just wiggle you finger to create a doodle masterpiece! Color packs must be separately purchased. A handful of colors are included with app. Take turns drawing and guessing at your own pace. No rush, no timer. Get rid of letters in the grid that are not part of the word to be guessed. Basically, you can sign in via Facebook or email. Get to know your friends' user names and invite them to create a drawing with you. You are given 3 words from which to choose one to draw. If the words look pretty impossible to draw, you can get a fresh pick. Choose one and start your artwork! Pick from varying pen sizes and a few different colors. You may purchase more colors if you wish. Redo your drawing countless times until you get it right. Once your creation is done, it will be sent to your friend who will attempt to guess what it is. 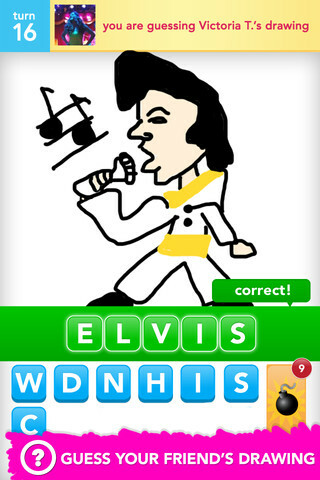 Most likely your friend will have a good laugh at your expense, if you draw anything like me! Once your buddy guesses what your drawing represents, he or she then produces their own drawing which comes back to you to uncover its secret! There is a word grid on your display with jumbled letters, some of which spell out the word of the drawing. This, of course, is to help you guess that unfathomable bit of artwork. If you guess correctly, you get points which may be used to later purchase more color packs or word bombs to help unscramble future drawings. One thing I'd love to see incorporated, however, is a chat function so you can tease your friend on just what you thought of his "effort" to make a "fine" drawing! It would also be great if you could include more than one person at a time in each game. Online help is available in the app, though you probably may never need to use it! Lots of fun and great bonding with friends and family is what you can expect with the uniquely creativeDraw Something Free. COOL CONCLUSION: Hone your drawing skills with Draw Something Free, the app that tests your ability to translate a written word to artwork on paper - a humorous and challenging time-passer for everyone!